The great Canadian philosopher George Grant once observed that in attempting to think coherently about the meaning of modern technology, “we apprehend our destiny by forms of thought which are themselves the very core of that destiny.” Grant’s remark comes to mind when thinking about the unprecedented frenzy to interpret, and in many cases to preempt, Pope Francis’s much anticipated encyclical, Laudato si’. Interpreters on the secular and Catholic left, eager to claim the pope’s validation of progressive politics, waited anxiously to see whether Francis would throw the weight of magisterial authority behind the latest climate science and the environmental movement and hoped that he might throw in a few denunciations of capitalism for good measure. Commentators on the secular and Catholic right, fearful that the pope might validate progressive politics, waited anxiously to see whether Francis would put magisterial authority behind the latest climate science and the environmental movement and worried that he might throw in a few denunciations of capitalism for good measure. Judging from the aftermath of the encyclical’s release, neither side seems to have come away disappointed in its expectations. 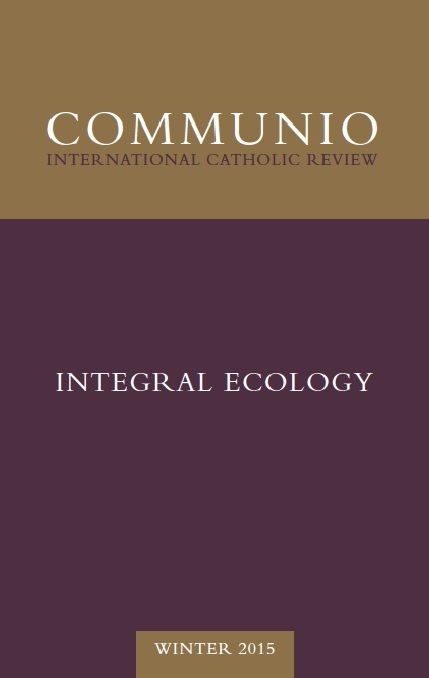 And yet amidst all this political wailing and gnashing of teeth there has been precious little in the way of serious theological and philosophical reflection about this stunning encyclical or the problems it seeks to confront. Whether or not one accepts the latest models regarding anthropogenic climate change—and Pope Francis and his advisors clearly do—it should not take an impending climate apocalypse to see that three centuries of technological and industrial development have taken a massive toll on the natural world. How are we to understand this crisis? And what is the specific task and mission of the Church in this moment? Is the Church merely one of many voices in a vast multicultural dialogue? Is it enough for the Church to throw its moral weight behind the latest climate science or the Paris climate accords? Does it suffice for Christians, seeking to live out the pope’s “ecological spirituality,” to consume a little less, rest a little more, turn off the air conditioning, or drive a hybrid? Or does the Church have something unique and indispensable to say?